How many more lives will America’s wars claim? When the war drums begin, the first victim is reason, this is no secret at all. I recently met with a group of Russian war veterans about this issue, how those who fight wars are victims just like the armies of refugees and the dead strewn across the landscape, now called “collateral damage” that may well represent a countless multitude. Do remember, the Vietnam War was stopped, not by “peaceniks” but by combat veterans who hit the streets, people like John Kerry or, to a lesser extent, me. That these movements survive in a small way, in reality dissent has been criminalized in a world of fake information and even more fake leadership. America marched to eternal war after 9/11 despite the fact that any reasonable and informed individual minimally has to brand Saudi Arabia, not “al Qaeda” as the perpetrator. I would go further and say that the partnership we saw in Syria between Saudi Arabia and Israel began well before 2001, but that would make me a conspiracy theorist, and in a time of fake everything, that must be worse somehow, though the difference is increasingly hard to understand. Let’s remember, it was Osama bin Laden and al Qaeda, based in Peshawar, Pakistan during the 1980s, that received American Raytheon Stinger missiles to shoot down Russian helicopters in Afghanistan. Wasn’t it the same al Qaeda, under the name “Jabat al Nusra” that received the same Raytheon Stinger missiles from the CIA to shoot down Russian helicopters in Syria, until a few weeks ago when we were told that the CIA was asked to stop supporting al Qaeda. In a world where America openly supplies al Qaeda with weapons of mass destruction, where Israel and Saudi Arabia fight side by side, and where “alternative facts” are used to support government policies, dissent itself is now a form of terrorism. Military veterans aren’t all equal. Just visit Washington DC or towns like Annapolis, Maryland. There the strutting peacocks in uniform have profited greatly from war, wars they risked nothing fighting, wars they were paid to support and defend, not the nation, the United States mind you, but war itself, the business, the racket, the game. There are real veterans out there, from every nation, tossed on the scrap heap of history when they are used up. One nation above all abuses its combat veterans, consigning them to misery and death, more than any other. That nation is the United States. What if I told you America has lost half a million dead, military casualties of the bogus War on Terror? We all know that many Syrians have died, or so we are told by CIA backed propaganda organizations like the White Helmets and Syrian Human Rights Observatory. What if I told you that America’s real dirty little secret is that so many of America’s military have died from Gulf War Syndrome, suicide and a pattern of unimaginably bad medical care that this in itself may well constitute a war crime? Why don’t the numbers come out you ask? The answer is simple, collecting data on the endless number of American military victims of America’s wars is a crime. Records aren’t kept, statistics are forbidden because, if a problem is unproven, it doesn’t exist. This is a big game in Washington, America’s injustice to women and minorities, particularly the pattern of victimization of the poor by the criminal justice system can’t be addressed because there are prohibitions against documenting injustice in America. I recently went over this with a member of the US Civil Rights Commission, quickly assessing that their pattern of failures has predictable roots, nothing in the US is counted, no records are kept, dead military veterans, jailed mothers with small children, those who committed minor drug offenses but serve decades in prison, no, this is only a small part of it, but today we are going to talk about the military, where I have my expertise. In 1970, I returned from Vietnam and began medical treatment in the huge government system run by the Veterans Administration. My own injuries seemed minor as I entered the filthy hospital in Ann Arbor, Michigan where amputees lived on gurneys all over the building, stored in kitchen areas, storage closets, overflowing urine bags, the stench of gangrene, the moaning of endless pain and hopelessness. This is what was really there, I saw it, I remember every minute of it. In 1938, American author and screenwriter, Dalton Trumbo, wrote an anti-war novel called Johnny Got His Gun. Trumbo was later blacklisted as a Russian sympathizer and banned from writing though, secretly supported by actor Kirk Douglas, Trumbo penned the screenplay of the academy award winning film, Spartacus. Trumbo’s novel was about the Veterans Administration health care system and how a severely disfigured combat veteran of World War I was hidden for years in a storage closet where he was attacked by rats. Employees who went to his aid were threatened and silenced, just like today. In 1938, disabled veterans were an inconvenience. They still are, except at election time when each new candidate promises to address the wrongdoing of their predecessor and, of course, in the end, nothing whatsoever changes. The Trumbo novel, fiction, is almost identical to the scandal at the massive Walter Reed complex where members of congress receive their medical care. The rundown and rat infested buildings at Walter Reed, during the Bush 43 administration, were used to store disabled military, until the Washington Post found out about it anyway. My own experiences go back to Vietnam, this was my war. Few are aware that Democratic Senator Phil Hart pushed to have Marines retasked from amphibious assault efforts which were producing casualties 400% of World War II levels. I served with one of those units. 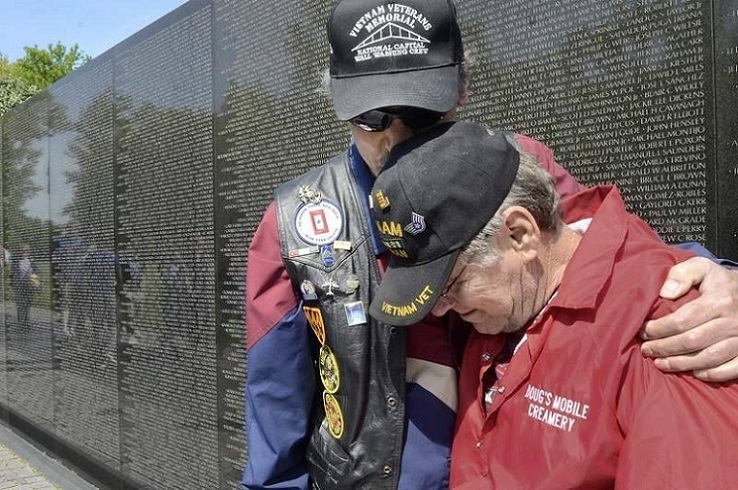 When veterans returned from Vietnam, the suicides began, PTSD or Post Traumatic Stress Disorder, it would be eventually called. The same was true of other wars but no one counted them either, the suicide deaths eventually hit the hundreds of thousands for Vietnam. For other wars the numbers may have been higher, but then we will never know as no one counted. They still don’t. Then there is that other thing, “Agent Orange,” the defoliant used across Vietnam that was laced with dioxin, a powerful carcinogen. Chemical companies were sued for this decades ago, billions were paid out, almost all to lawyers. Veterans received nothing. How many died from Agent Orange? The number runs between 700,000 and 1.1 million. Vietnamese have died by the millions and are still dying but we can’t talk about that either. The number who died of Gulf War Syndrome is certainly in the tens of thousands and those who investigated where harassed and threated by military intelligence operatives, something Veterans Today carefully documented. It is also said, albeit not so publicly, that many have died of diseases like multiple myeloma. The cause of that disorder is exposure to ionizing radiation from things like partially depleted uranium projectiles or the suspected clandestine use of prohibited fission based weapons. When illegal weapons are used, nuclear, biological or chemical, the military veterans who become victims are forced to die from the disease of official denial and anyone who thinks nuclear, biological and chemical arsenals aren’t deployed against targets in the Middle East is a fool. All processes from applications for pensions to seeking medical care itself is made as frustrating and burdensome as possible. Even a phone call can lead to long and pointless recorded announcements, which lead to more of the same and, eventually, systems that either hang up the phone or route calls to recording devices that are often never checked. The other is “medical mistreatment.” Here, the world’s largest and most expensive health care system, yes, it is really that big, shuffles millions of patients in and out without treatment plans, testing or follow up care. Care is rationed with waiting lists for things like expensive dental work or knee replacement surgery taking more than a decade. Patients who can’t walk because of easily treatable conditions are given canes or wheel chairs and sent away. Tests when conducted are often never reviewed and there is no accounting of any kind. No professional license is needed because federal government facilities are above state law and there are no national regulatory agencies for health care professionals. Yes, you can lose a license to practice for very serious violations and work for the Department of Veterans Affairs. The number of instances of patient abuse, even killings, is insanely high but also quickly suppressed. Veterans service organizations, who help “police” this system are generously paid off and remain silent, more a part of the problem themselves, even more than this corrupt bureaucracy. What is really being hidden is the cost of America’s wars. You see, the new professional military that Nixon gave the US after Vietnam is a “garrison army,” not a combat army. Troops who fight year after year, even in air conditioned comfort, we are told, paid 20 times, corrected for inflation, what was paid to those who fought in Vietnam, eventually become institutionalized and unable to maintain normal employment. When, because of physical or psychological conditions which will invariably result from multiple deployments manifest, these soldiers are more often forced out, charged with an offense of some kind, or disallowed from continuing service and receiving a retirement pension. This places those who qualify, and not all qualify, in a medical system designed to make dying seem attractive. Were one a conspiracy theorist, one might well postulate that using ISIS or similar organizations to fight America’s wars could be a money saving ploy. Certainly Israel provides far better medical care to al Qaeda and ISIS fighters than America does to her own troops. Instead of killing them off after they are no longer needed, with poor medical care, America can just start bombing them. America’s governmental bureaucracy offers both “fake” medical care and “fake” bombing and accepts each as business as usual.